"You're invited to a fox's feast!" Journey deep underground with the badgers, weasels, rabbits - and yes, foxes - for a celebration of courage, family, and community. Mr. Fox knows he must be clever to save his family from a trio of spiteful farmers, but in a twist of tunnels, he becomes the hero of the forest! David Wood's exuberant adaptation of Roald Dahl's classic book, accompanied by live music, is a Chicago premiere. "...From the moment that the audience enters the theatre it’s pure magic. Everywhere there are instruments being played, songs being sung, bubbles being blown, finger games being shared and beachballs being tossed around the audience. It’s guaranteed that even the shyest child will instantly become involved and ready for the story to unfold before their widening eyes. Fun? Yes sir! Frantic? Of course! Fantastic? Indeed!." "...The original songs for this production are often upbeat, catchy romps, such as the one about digging, sung by the foxes (Adhana Reid, Rebecca Keeshin and Mario Aivazian). Mrs. Fox (Tia Pinson) stands out as having a particularly lovely voice as she sings to her two fox children. Some of the songs, however, do become a bit scary as the farmers clang shovels on metal bars while they sing about digging out the foxes. Then later they bring in large machines to help dig deeper and faster to get at the foxes." 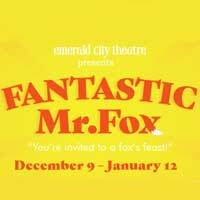 "...Overall, for the beautiful acting and the amazing introduction to how important the technical aspects of theater are in creating the story, I would recommend The Fantastic Mr. Fox for those both with complicated and uncomplicated Roald Dahl relationships." "...Cleverly accessible storytelling and an engaging ensemble make Fantastic Mr. Fox in this writer's opinion the perfect production for the whole family."